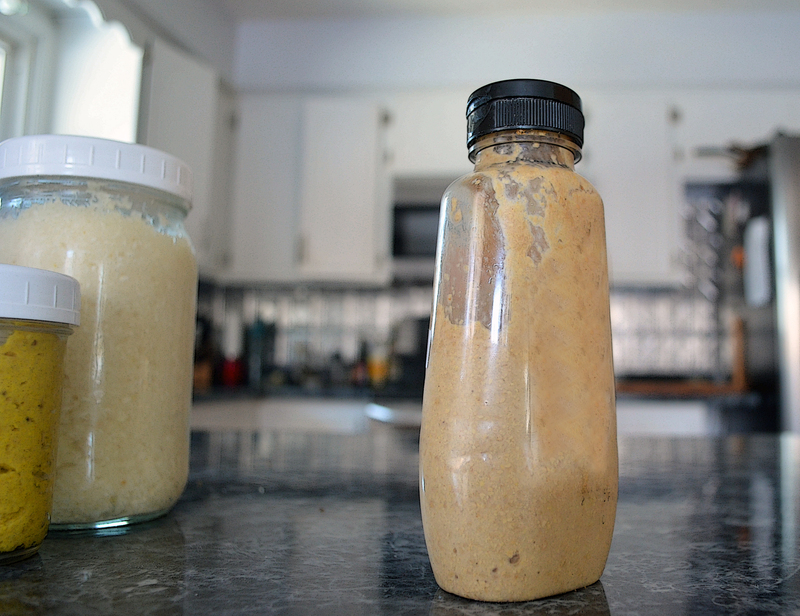 Making your own kombucha mustard is one of the easiest fermented condiments you can make. So here goes. As people have heard me say before, this is more of a method than a recipe and uses only two ingredients. Place mustard seeds in a clean, wide-mouth quart jar with plastic lid. Pour in half the bottle of kombucha and let sit on your counter for a day or two. If you see that the kombucha is completely absorbed, pour in about another quarter of the bottle and let sit another day. You may or may not use the entire bottle. After 2-3 days, place mixture in a blender and puree, either to a fine texture, or coarse (I like finding the occasional whole seed in the finished mustard) it’s up to you. While you puree, you can add the rest of the kombucha if needed. Once you have the consistency you want, you can refrigerate it in the quart jar, which will be nearly full or portion into smaller containers.